“Family is super important to me. We’re really excited. We can’t wait for that day to come.” — Ben, from the interview below. Ben Roethlisberger said he can’t wait to be a father, and he is hoping to be just like the one who raised him. Roethlisberger and his wife, Ashley, are expecting their first child, a boy, though the two-time Super Bowl winning quarterback did not divulge the due date. 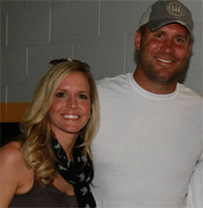 Roethlisberger said he hopes to celebrate another Super Bowl victory with his growing family. “If you talk to any player, the ultimate goal is try to have your son or daughter or both at the Super Bowl, so that’s going to be my goal now to get a Super Bowl because I don’t think there’s anything better than having your family on the field with you when you’re holding that trophy and the confetti’s falling,” he said. Ben’s thoughts on the first day of mini camp can be found here.